Research shows that half of the predicted difference in career success (i.e., promotion, compensation, industry recognition) is due to this one variable. Model derived from Ronald Burt's research (above link). Simply put, according to multiple, peer-reviewed studies, being in an open network instead of a closed one is the best predictor of career success. But it is not all sunshine and rainbows. It is challenging, because it requires assimilating different and conflicting perspectives into one worldview, which is a considerable cognitive payload. Managing your time to connect with a broad network is also difficult. It requires sacrifice of things that are more fun and easier. It requires a belief that "turning up" is very important, even when not obvious. It requires you to engineer serendipity in order to unearth opportunities. 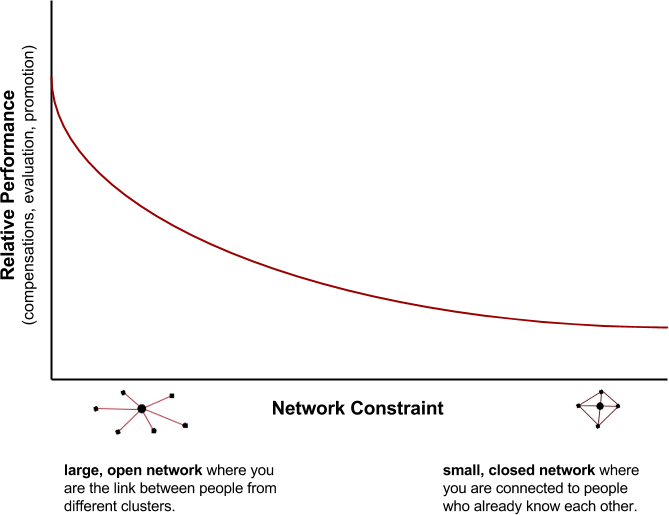 And large and disparate networks can be a force multiplier. 1. More accurate view of the world. It provides them with the ability to pull information from diverse clusters so errors cancel themselves out. Research by Philip Tetlock shows that people with open networks are better forecasters than people with closed networks. 2. While they may not be the first to hear information, they can be the first to introduce information to another cluster. As a result, they can leverage the first move advantage, thereby increasing political capital. 3. Ability to serve as a bridge between groups can create enormous value, which increases the connector's political capital.